It’s silly to get so upset over a halloween costume; people need to get a life. 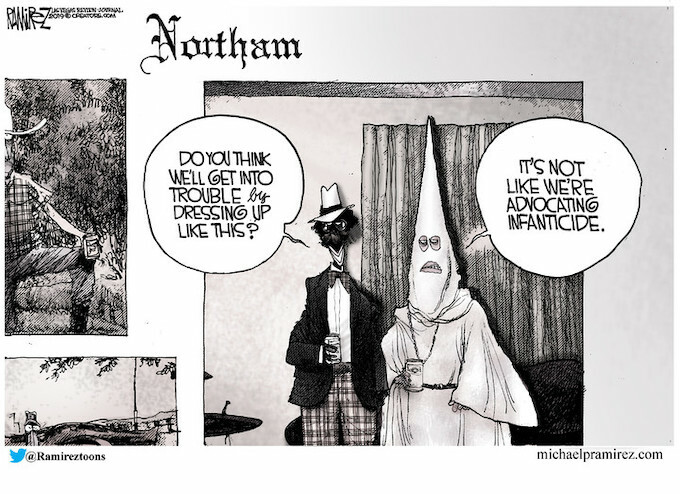 Of course this was just a way to get focus off of what Northam said about infanticide; He let the cat out of the bag about how the Democrats feel about abortion. Dems “hoist on their own petard”. Kind of amusing. imagine, a Democrat southern racist. Who could have imagined it. Exactly!!! I keep seeing conservatives on this site defending Democrats for wearing blackface. The fuss about blackface at costume parties is something the Democrats invented, now they are hoist on their own petard, as Bill reminded us. When your enemy is destroying himself don’t defend him, get out of the way and enjoy the show. My defense though, comes in as “WHY Should they be held accountable for something DONE 30+ years ago, when back them it was not seen as wrong..
My suspicion has ALWAYS been that the DEMS are the ones who “outed” this photo–precisely to distract from his appalling remarks about casually killing infants AFTER they are born, if they manage to survive the attempt to abort them during birth! That tactic has LONG been part of their arsenal when one of their own is too candid about their EVIL plans for America. The utter hysterics they and the media have been having over the photo is proof enough to me that this is yet another calculated Dem distraction! The only GOOD news I can see from all the Dem goings-on is that no matter how united they pretend to be, the Dem Party is obviously DEEPLY divided, and there is a WAR going on between the Leftist LOONS who want to go full-out Communist and the rest of the Party who fears they cannot win with a blatantly Communist platform. And that is a GOOD thing for the rest of us! Because no matter how divided they are, they are still united in their objective: to get and KEEP power and control over the rest of us. I don’t believe there IS a “good” side to the Dem Party. I think it is irredeemably anti-American and EVIL, and those who merely want to put a kinder face on it so they can con people into voting for their own economic destruction and loss of freedoms are no better than the blatantly Socialist contingent. Well, its good news for the Republican speaker.. He’s the only one not yet screwed! So if they DO some how force these 3 out, the state switches back to republican hands.. The radical Leftist Media needed this to DISTRACT from the real story… the MURDER of infants. While the Spineless GOP hide and do nothing. Now one of their OWN in VA is getting caught up. The Speaker of their house, apparently had some underpinnings of racist talk in a year book HE was the editor for. ALL THE WAY BACK IN 1968!!! That’s how desperate they’ve become. Going to the 60s to dreged up stuff.